Just opened the kiln and so far, so good. This was a first firing for the ware—the bisque firing, to prepare the work to receive glaze and be fired again. In general, the bisque firing is slower than the glaze firing, and is intended to burn out materials in the clay that could cause problems for the glaze. There is a lot of chemistry in pottery making! I usually work in earthenware–kiln temperatures are set for around 1900 degrees F for both the bisque and glaze firings. In this case, I’m firing stoneware, and the second firing will be around 2200. Those few hundred degrees make a huge difference–clay bodies and glazes are formulated to withstand the extra heat. Some colorants would burn out at these temperatures. 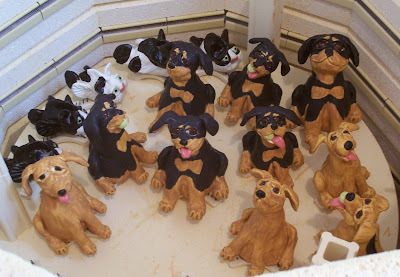 Friends Suzanne & Tom are coming over this afternoon to glaze some pieces they made a while back. This couple, along with Jackie and Mike, were the first people, other than myself, to create work in the new studio (more on that in another post). I’ll plan to take some pictures, but have to unload the kiln and clean up the studio so we’ll have room to work. I have a lot of projects in progress, and people who know me can tell you I’m pretty messy. In the meantime, if you want to see the type of work I create, please check out the websites for Carolina Designer Craftsmen (http://www.carolinadesignercraftsmen.com/member_page.php?member_id=240) and Alamance Artisans Guild (http://www.alamanceartisans.com/1_hand.php?id=3).